By car: from the highway D5 – 5 min. Turn right at the IKEA store. Exit 2 right direction and Řeporyje continue on Jeremiašova. At lights next to the supermarket Billa next to the supermarket Billa (it’ll be on your right side) turn left into the street Oistrachova which passes into the street of the Army. After about 1 km turn from the main road Mládí right onto K Lužinám and immediately left into the street Na Dolnici. Pension Zuzana will be located at your right hand. It is visibly marked, you can not miss us. Public transport: Use the line B – direction Zličín and get off at the stop Lužiny. Then walking through the Bronzova street down to the central park. At the bottom part of the street go right to dam pond, walk through and go on straight ahead between 4-floors houses to the street K Zahradkam. Go on at the left side about 100 m and then right to the street Na Dolnici. Pension Zuzana stands on the left side. If you use the metro, get off at Luka and use the bus Nr. 174 – Vypich direction. Get off at Mládí and then turn right to K lužinám, then left to Na Dolnici. 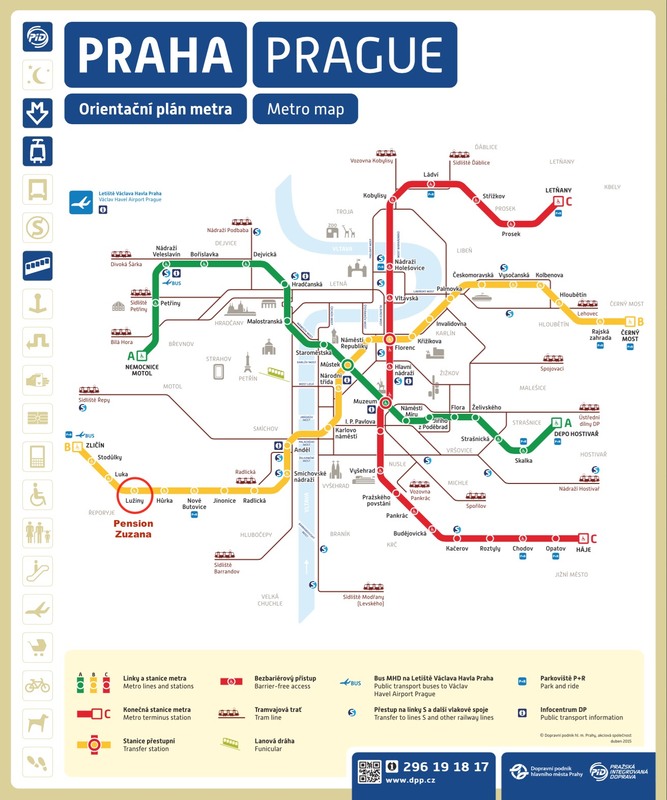 Use the metro line B in the direction of Zlicin and get off at Luziny station. From there, walk down the Bronze Street down towards the Central Park. At the bottom of the street, go to the right by the sidewalk to the dam of the pond that you go to and continue straight between the 4-storey residential buildings to K Zahrádkám Street. To the left, about 100 meters, then go down the sidewalk to the right onto Na Dolnici. PENSION ZUZANA is located on this street on the left and is marked.